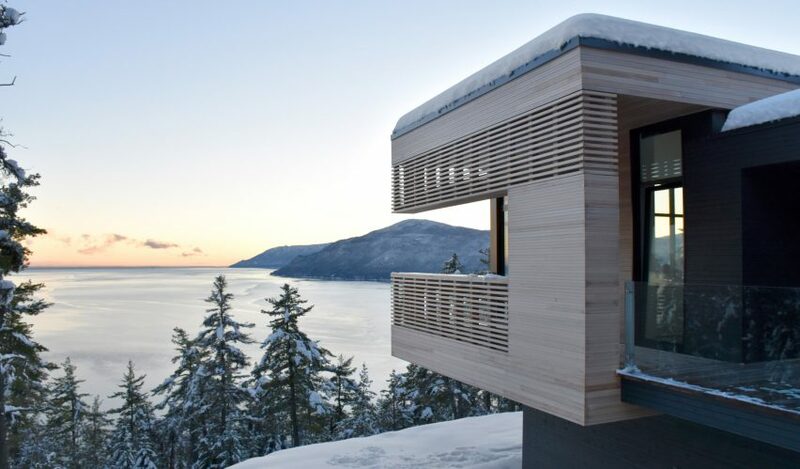 Quebec studio Anne Carrier Architecture has designed a dwelling comprising a collection of rectangular volumes, which offer a balance of privacy and views in a scenic setting. 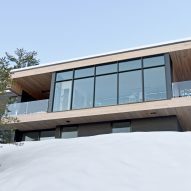 Located in Cap-aux-Corbeaux – a small town in Quebec – Residence Le Nid is perched on a forested hillside, overlooking the Saint Lawrence River. Influenced by the natural landscape, the building's wooden exterior is intended to match the bark on the pine trees that surround the property. The wooden screening – referred to as "the nest" – wraps around a balcony on the upper level, maintaining privacy while allowing light to enter the interior. This portion is clad in a lighter-toned timber than the rest of the exterior, creating a focal element. 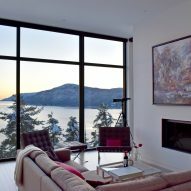 Anne Carrier Architecture envisioned the house to be both a liveable space and vantage point from which to enjoy shifts in the surrounding nature. "The original intention was to shape the site so that users would be living inside an artwork that would constantly change with the seasons, weather and time of day," said a statement on behalf of the studio. A bridge made from cedar forms the path to the main entrance, which connects to the home's upper level. 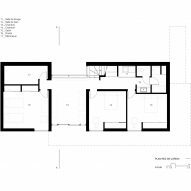 The foyer opens directly into the central living space and kitchen, where windows stretch from floor to ceiling, and frame panoramic views of the river and neighbouring towns. 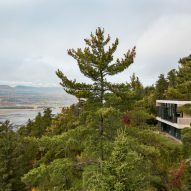 "Resembling a triptych painting, the lateral bay windows complement the composition of the main view, allowing glimpses of the tip of Ile-aux-Coudres to the southeast, and of the countryside northwest of the town of Baie-Saint-Pau," the team said. A glass cutout at the centre of the structure makes room for covered outdoor areas within the house. The master bedroom is accessed through a hallway, which holds closet storage and adjoins a full bathroom. Facing the river, the suite is situated to make the most of its scenery through windows that provide sight lines to the water. 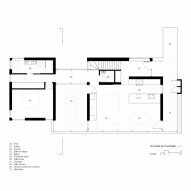 A staircase leads to the lower level where three additional bedrooms and a bathroom are located. The dwelling's structural elements, insulation, and electrical systems are integrated within the floor and roof to disguise the technical challenges of its construction, which involved cantilevers and heated sections. 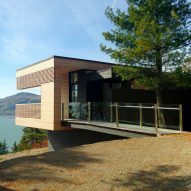 Anne Carrier Architecture has completed several projects in Quebec including a visitor centre in Mont Orford National Park and a welcome pavilion at a cultural heritage site near the Saint Lawrence River.